Interior designer Alison Stearns enlivens her century-old home with a collection of mid-century furnishings, bold contemporary art, European antiques — and even a bit of zebra print. 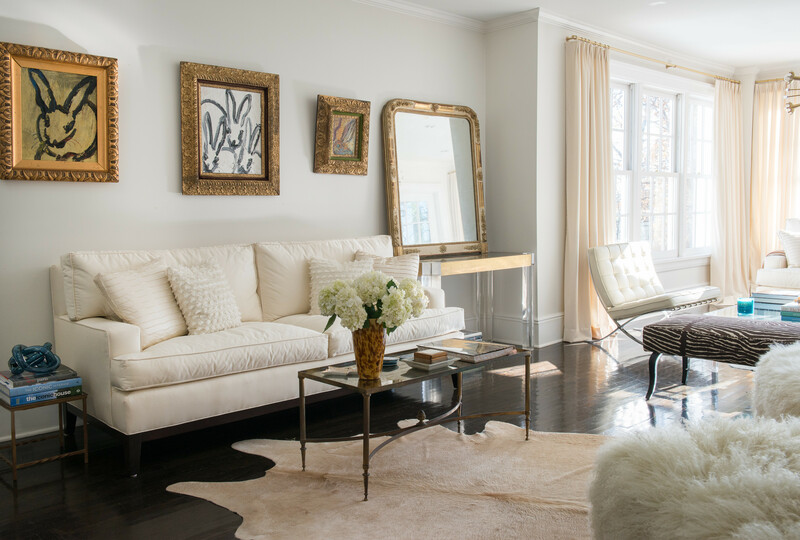 The spacious seating area is inviting and is anchored with a hide rug, lucite coffee table, and stacked art books. Alison Stearns tried to resist the old house’s charms. During her search for a new home in Rye, New York, she had walked through its rooms and imagined her family living in them, only to walk away. “I knew that moving here would entail switching school districts, not to mention making a lot of changes to the house,” the designer and a principal of Keough Stearns Interiors — a firm she founded with friend Megan Keough — explains. But more than half a year after her first visit, when the house was still for sale, and still on her mind, Stearns gave in and made an offer. I think an important part of any renovation is taking time to live in a place and discover what’s going to be important to your lifestyle. There was a lot to love about the 100-year-old home. Tucked away on a quiet tree-lined street, it offered plenty of privacy yet was only a five-minute walk from the train station in the heart of Rye. It captured all the romanticism of the picturesque Tudor-Cottage style with its steeply pitched roof, prominent stone-and-brick chimney, and cozy bedrooms built into the eaves. But, what captivated Stearns most was the light. "It’s deceiving," she says. "The exterior doesn’t suggest how light and bright it feels inside all day long. In the morning, soft light floods my bedroom and the kitchen, and the evening sunsets at the front of the house." A graceful table and antique French armchairs lend an air of refinement to the dining room. 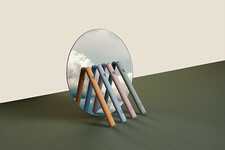 Closer inspection reveals a few unexpected finds: a teak-and-sheesham-wood marquetry buffet and oversized silver lamps from Global Views, and a mod metalwork mirror designed by artist Curtis Jeré. But the place was far from perfect. The kitchen was cramped, the dining room was tiny, the bathrooms were dated and the main floor lacked a powder room. For several years, Stearns, her husband Neal and their four children lived in the house without changing a thing. 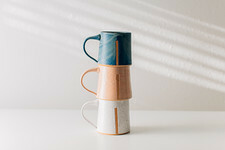 “I think an important part of any renovation is taking time to live in a place and discover what’s going to be important to your lifestyle, how you’re going to use each room and how you want to feel when you walk in,” she explains. A large white-lacquered desk with polished-nickel legs and hardware from Williams-Sonoma Home provides a work surface large enough to accommodate homework or art projects. 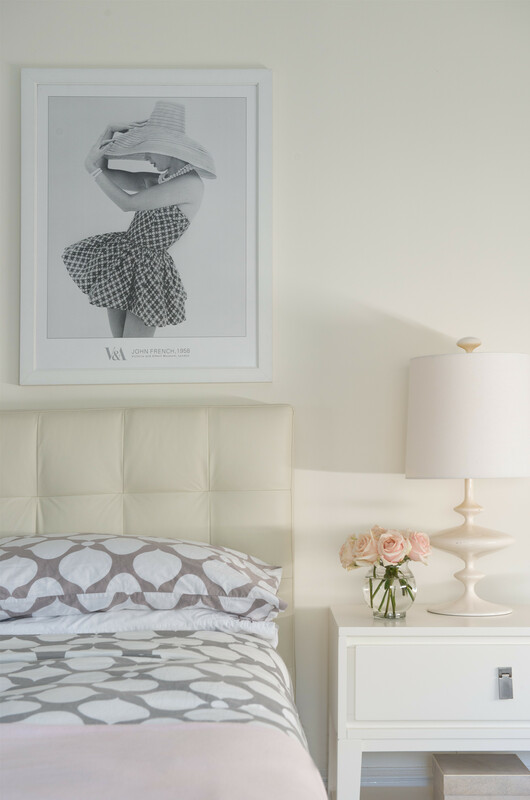 To personalize the space, Stearns selected artwork that celebrates her daughter’s love of fashion, including vintage black-and-white fashion photography. 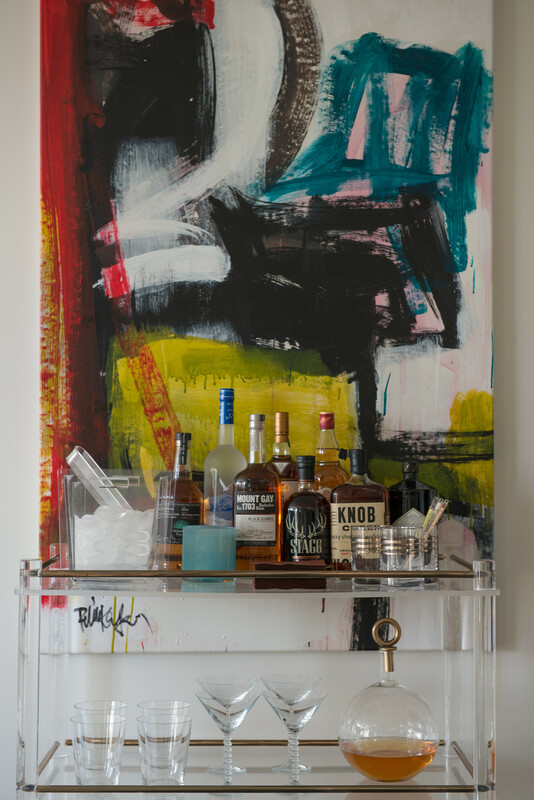 Stearns keeps her midcentury French bar cart stocked with barware and bottles. A large painting by Robbie Kemper hangs behind it. “I just love the color and freeness of the brush strokes,” the designer says of the contemporary piece. For Stearns, it was important to create a place where her children would want to spend time with their friends. Must-haves included a large kitchen that would function as a central gathering place, living and dining rooms spacious enough to host holiday get-togethers with the extended family, and a separate bedroom for each child. The spacious living room offers two separate seating areas. This inviting arrangement includes a Kravet sofa upholstered in Holly Hunt fabric, shaggy alpaca-upholstered stools, a hide rug, and an antique brass-and-mirror coffee table. Ornate frames and velvet borders add texture to three paintings by Hunt Slonem, an artist known for his charming and abstract representations of bunnies. Stearns purchased the large gilt mirror at the Paris Flea Market. With plans for the extensive renovation in place—with help from Paul Benowitz of Benowitz Shah Architects—Stearns’ team began the work of expanding and improving the floor plan on each of the home’s four levels. On the ground floor, they created a large family room, casual TV room, laundry room, mudroom, guest suite and small exercise room. On the main level, two rooms were combined to create one large dining room, a powder room was added, and the kitchen was renovated and expanded with a new butler’s pantry, bar and adjacent sunroom. The third-floor master suite was renovated, and even the attic got an upgrade: Stearns used some of the unfinished storage space to expand two top-floor bedrooms, a common workspace and a shared bathroom for her daughters. “I had a vision of a clean, white wall,” Stearns says of her bright and uncluttered new kitchen. 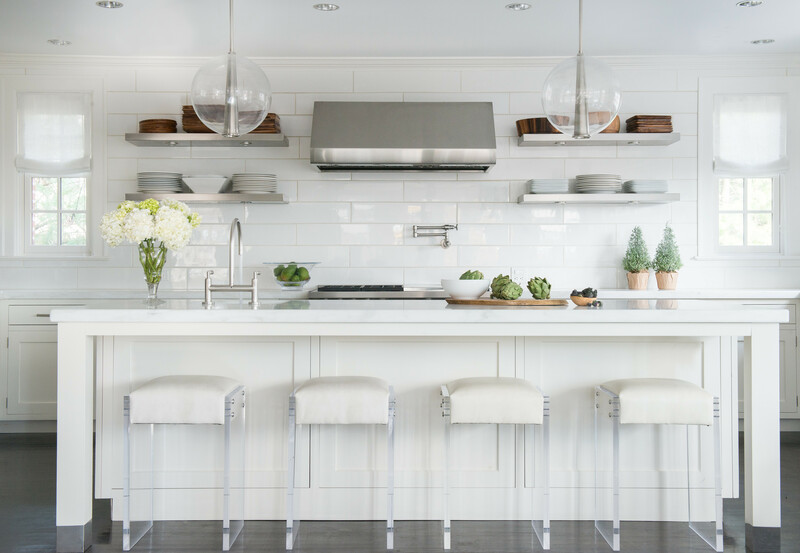 Stainless-steel shelves—with halogen spotlights that illuminate the countertop below—offer storage space without detracting from the 30-inch-wide wall tiles from Waterworks. Merging such traditional details with her eclectic collection of midcentury furnishings, contemporary art, French antiques and retro 1960s finds was a challenge the designer was excited to take on. "It's like a laboratory," she says of her interiors. "I can experiment and take risks in my own home that I can’t take with clients." ON A twinkling Sputnik-style chandelier from Jonathan Adler and reproduction Barcelona chairs energize the traditional living room with a sleek midcentury vibe. 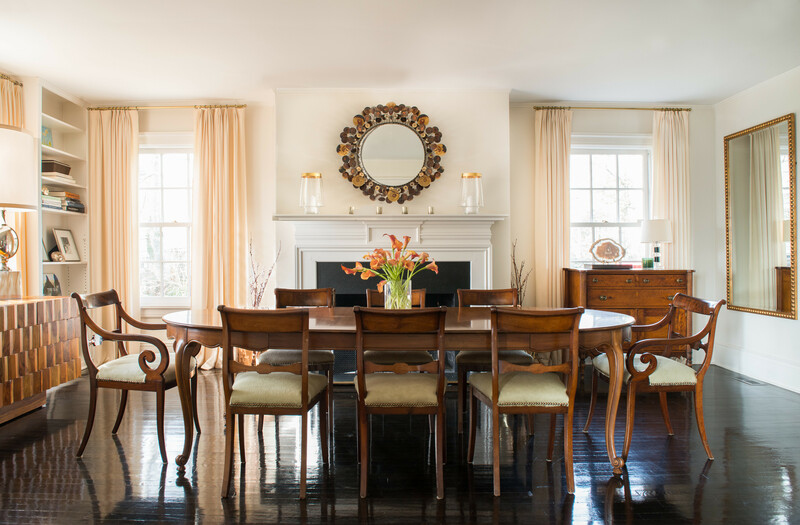 In the now-spacious dining room, Stearns paired her mother-in-law’s old table with a set of graceful French chairs reupholstered in pony hair. She hung a reproduction Curtis Jeré brass mirror above the traditional mantel, and mounted a dramatic piece of contemporary art on the opposite wall. At one window, she topped a sculptural buffet with a pair of oversized silver lamps. A midcentury Lucite-and-brass coffee table grounds the living room’s arrangement of streamlined Barcelona chairs, a zebra-print bench, hair-on-hide rug and brass Sputnik-style chandelier. The kitchen’s pristine expanse of Calacatta marble and 30-inch-wide tiles from Waterworks defers attention to showy glass-and-metal-mesh pendants and an adjacent dining nook furnished with a sleek Saarinen-inspired table, vintage Lucite chairs and a velvet-upholstered banquette ("Dumb, but I couldn’t resist!" Stearns says of the rather impractical material.). It all goes hand in hand with the feeling I wanted to create in the house. To unify such diverse styles and sculptural shapes, the designer relied on a consistent palette of "very mellow" tones, ranging from whites to grays and greiges, and inviting textures: hide rugs, plush carpets, wool draperies, cashmere throws, velvet upholstery and pillows, and acrylic and oil paintings. "It all goes hand in hand with the feeling I wanted to create in the house," Stearns says of her composition: "welcoming and beautiful — but not so beautiful that we felt we couldn’t live in it."